Gana Energía is an electricity company, set up in 2015, that aims to be the benchmark energy company for all users who are tired of traditional electricity companies. Guided by their “eco-friendly” values and with the aim of facilitating and streamlining users’ lives, they incorporated Signaturit’s advanced electronic signature for registering new customers in the year the company was founded. This post aims to explain how Signaturit has helped Gana Energía to offer the best customer experience with the maximum legal guarantees. ¿Qué es la firma electrónica avanzada? ¿Cuál es la principal diferencia con la firma electrónica simple? - ¿Y con la firma electrónica cualificada? What motivated Gana Energía to start working with Signaturit? - Why does a potential customer abandon an onboarding process? How is the signature process now thanks to Signaturit? In 1997 the European Union forced the government of Spain to liberalize the energy market in order to encourage competition and therefore improve the industry in general. This allowed new companies to enter the different phases of the market - production, distribution, transport and marketing. Gana Energía is one of those new companies that set out from the beginning with the intention of doing things differently and winning the trust of users who were somewhat fed up of the industry. For it to be a real alternative to the oligopoly of large electricity companies in Spain, they offer users the best electricity rates on the market and services where the customer is the focal point. In addition, with some global energy challenges on the cards, - the Paris Agreement of 22 April 2016, set the objective of limiting the rise in global temperatures to below 2°C - Gana Energía stands out due to being a 100% renewable energy supplier company. With these “eco-friendly” values it is not surprising that, in the year it was founded, Gana Energía sought to digitally optimize all its user registration processes and incorporate Signaturit's electronic signature following a paperless philosophy and offer the best user experience. 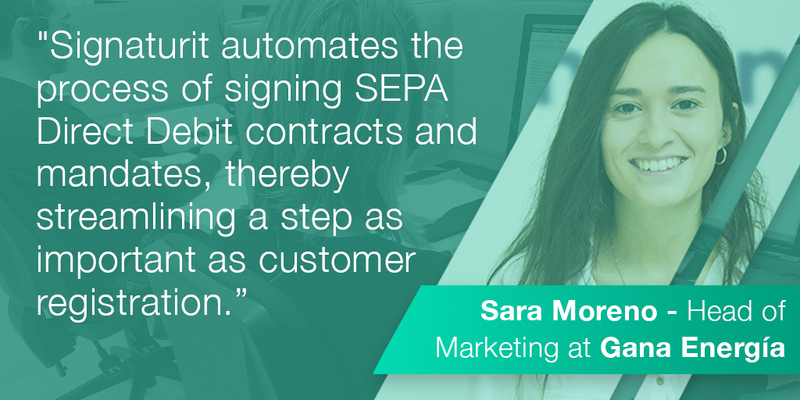 Sara Moreno, Head of Marketing at Gana Energía, explains that the electronic signature project came about to get rid of its previous process for signing contracts and SEPA mandates, which was quite straightforward for a 100% digital native company. Why does a potential customer abandon an onboarding process? Registering for an online service and being able to manage the registration from the comfort of the sofa are some of the many things that, nowadays, we prefer to do online, and if the entire process can be carried out digitally, all the better. It saves us waiting, printing, scanning and making copies of documentation that we will surely lose. However, data indicates that many consumers abandon the onboarding process in an online service. Why is this? It is usually due to causes intrinsic to the process itself, not because the customer has changed its mind and decided to go with the competition. - The onboarding process is slow. If we deem the process to be excessively slow, we abandon it. - We are asked for too much information. Simplicity is the key to these processes. - The process isn’t 100% online. If the potential user has to go to a physical office to get the documentation, or print to sign and send it again - that is if they even have a printer at hand - it doesn’t make sense to waste time with the online process. The process is simply abandoned. The process is simple and fast. The user fills out a form in just 2 minutes and once Gana Energía professionals receive that information they send the contract, along with the necessary SEPA mandate, for both to be signed online whether with their finger if they are using their mobile, with a ‘stylus’ pen if they are using a tablet or with the mouse itself. Thanks to the integration via API with Signaturit, Gana Energía receives all the documents signed in a flexible and secure way, respecting the data protection law at all times. 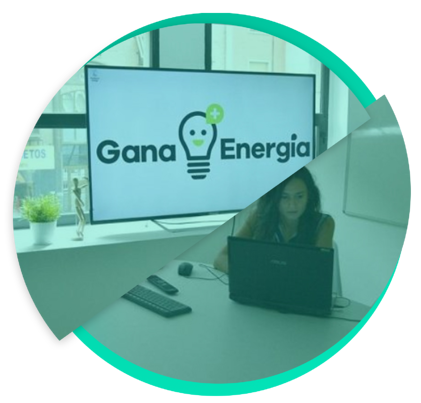 It is a "secure, simple and intuitive process as the registration process includes an explanatory video, in case a customer gets confused"- as said by Sara Moreno, Head of Marketing at Gana Energía. In this way they have managed to optimize processes, reduce costs and offer a personalized service to their customers with cost-reflective rates. Furthermore, Gana Energía emphasizes that the integration process via API was very comfortable for them so they were soon able to enjoy the advantages of 100% digital onboarding. To sum up, Sara Moreno states that the best thing about Signaturit is that “both parties win: the customer quickly and easily signs its documents, and we receive a copy of the signed document along with an audit trail or substantiating document, with the proof of the transaction generated during the signature process”. In summary, the digital tools for improving the user experience are out there as well as the willingness of the user to establish a 100% online relationship. Many companies such as Gana Energía have already understood this and started working on their side of things and the results are remarkable. Signaturit offers online solutions for signing documentation, digital communication and customer verification in order to prevent identity theft and provide a good user experience. 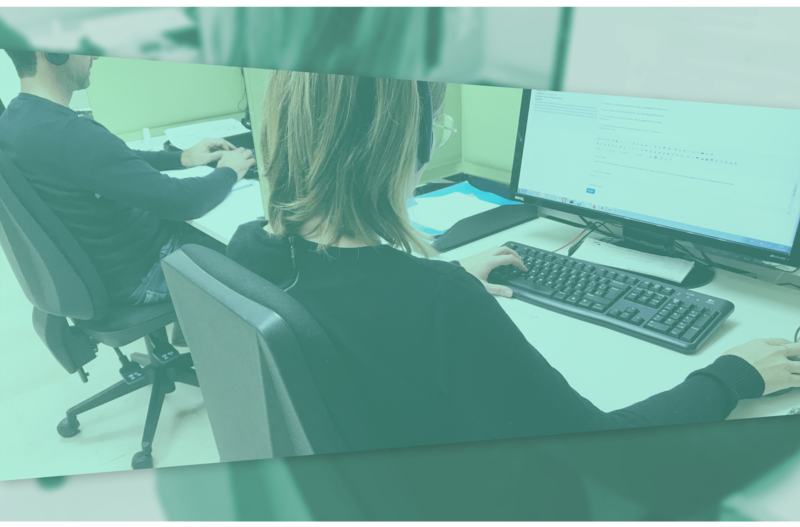 If you would like to know how Gana Energía implemented the advanced electronic signature solution for their registration processes in greater detail, and what the main benefits they have obtained are, don’t forget to download the success case below.